There is not much to say about this. They are clearly not flavor color coded. There are however bright colours and a backdrop of a clean and white bag. There is a bowl of Chips, but impressively a pair of chopsticks to pick them up with. 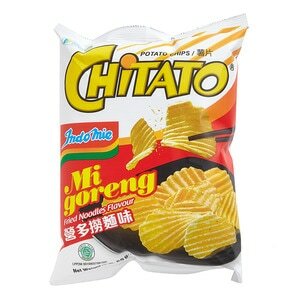 To this naive Western palate, these Chips were a bit of a culture shock. Indomie is synonymous with Indonesia and is kind of an unofficial official food. It is available all over the world and has a particular taste. The underlying flavours were Soy Sauce and spiciness. There was a fair claim to a bowl of [Fried] Goreng Noodles. There was probably some Paprika in there, along with a wide variety of chemicals.